Patients with significant congenital heart disease have a relatively high risk of developing occlusions of major veins, arteries or surgical pathways during their lifetime due to multiple factors. Surgical procedures, chronic intravenous lines, repeat cardiac catheterizations and periods of low cardiac output may all contribute to the development of vascular occlusions at many different sites. Acute or chronic occlusions of some vessels may have little clinical impact. However, successful recanalization in many instances can have significant short-term and long-term benefits. Surgical approaches to occlusions of large vessels have been relatively successful. Attempts to surgically recanalize smaller vessels or vessels with relatively slow flow in small children or in the more peripheral arterial system have frequently been disappointing. A small but growing experience with transcatheter recanalization of the occluded vessels in this difficult population is encouraging, but is limited. A few of the situations where transcatheter recanalization has been successful include superior vena caval (SVC ) syndrome,  acute and chronic occlusion of pulmonary arteries. ,,,, completely occluded Blalock-Taussig (BT) shunts, ,,,,,,, completely occluded venous pathways after atrial redirection procedures, , occluded pulmonary veins,  congenital or acquired atretic segments of the aorta , and acutely or chronically occluded ilio-femoral arteries  and veins. , In this article, we will review some of the general principles and approaches for attempting transcatheter vascular recanalization that we and others have found successful. Any attempt to recanalize an occluded major vessel has a significant risk for unintended vascular perforation and bleeding. We recommended that these procedures be carried out with general anesthesia. Complete immobility of the patient is more certain than with simple sedation. The procedures tend to be relatively long and may involve multiple steps. Control of the airway in an emergency is essential. Multiple sites of vascular access are often required. Biplane fluoroscopy is highly recommended as the intended pathway of recanalization may appear relatively straight in one view but not well aligned in the other complementary view. Equipment needs for vascular recanalization procedures may vary somewhat. It is almost always important, however, to have a variety of guidewires, low-profile balloons and stents available. Hydrophilic guidewires are superior to standard guidewires in crossing totally occluded segments in adult patients with peripheral vascular disease,  and we have had a similar experience in our pediatric and adult congenital heart patients. Guidewires with a soft tip may be beneficial for manipulation in newly recanalized vessels, but stiff guidewires may be important for the positioning of angioplasty or stent balloons. Hydrophilic catheters and microcatheters may be useful in wire exchanges. Snare catheters may be extremely helpful if there is access to the distal side of an occlusion. The opened snare can serve as a target during attempted perforation of the occlusion. If a perforating guidewire tip can be snared, control of the guidewire tip tremendously enhances the ability to safely force a larger balloon or exchange catheter through the occlusion over the guidewire. In some situations, a patient with an acute vascular occlusion may be critically ill. This is especially true if a BT shunt becomes occluded in a patient with limited other sources of pulmonary blood flow. In critically ill patients, it may be best to establish the patient on extracorporeal membrane oxygenator (ECMO ) prior to attempting catheter intervention. Intervention on a BT shunt through the side port of an arterial cannula in an ECMO circuit has even been reported. Availability of an experienced assistant may significantly shorten the procedure and may be essential for manipulating the accessory catheters, snares, etc. The presence of a funnel-shaped stump or a "dimple" in the area of occlusion helps to direct the catheter tip and ensure that an exploratory guidewire is directed toward a true lumen [Figure 1]a. Whenever possible, the target vessel past the occlusion should be visualized by placing a catheter in the distal segment or by roadmap images. Situations that may allow placement of a target catheter include discontinuous pulmonary arteries with shunts to both the right and the left pulmonary arteries, systemic venous baffle obstructions after atrial redirection surgery (Mustard or Senning), short segment atresia of a portion of the aorta and acquired occlusion of a portion of the iliofemoral system. In other situations, the existence, size and position of the vessel distal to an occlusion may be identified by angiography in the pulmonary artery wedge position (occluded pulmonary vein), pulmonary vein wedge position [Figure 1]b (occluded pulmonary artery), an aortopulmonary collateral vessel or other vessels that provides collateral flow to the occluded segment. Visualization of the distal vessel may be less important in the setting of an acute occlusion of a shunt or vessel with a known size and course. Most vascular occlusions in the pediatric and congenital cardiovascular defect patient populations are caused by thrombosis, compression of the vessel by an adjacent vessel (i.e., neoaorta compressing the left pulmonary artery after Norwood procedure),  twisting/kinking of the vessel or, rarely, processes like fibrosing mediastinitis. If the acutely occluded vessel is not recanalized relatively quickly, there is organization and tissue ingrowth into the occluded segment. It is generally much easier to recanalize vessels before this tissue organization proceeds to a significant extent. If recanalization can be attempted within days of the occlusion, there is an excellent probability that the occlusion can be crossed with simple guidewire manipulation. We and others have seen this to be true in pulmonary arteries, aortopulmonary shunts, iliofemoral vessels and catheter-related vascular occlusions. Successful crossing of an occlusion can be expected in over 90% of the lesions present for less than a few days if an adequate angle of approach can be achieved. Recent work utilizing three-dimensional micro-computed tomography in an animal model beautifully shows that chronically occluded vascular segments have multiple tiny channels in and around the occluding tissue. The existence of these channels may explain why small, "slippery" guidewires can sometimes successfully traverse occluded segments with surprisingly little force. In many cases of chronic occlusion, however, direct penetration of the tissue is necessary. This type of direct penetration can sometimes be accomplished with a sharp instrument such as a transeptal needle or the stiff end of a guidewire. In some cases, it may not be possible to apply sufficient force in the required direction. In these situations, radiofrequency (or much less commonly laser) energy can be used to "clear a pathway" that can be traversed by a guidewire with much less applied force. The major disadvantage of this approach is that destruction of tissue (rather than penetration) may increase the chance of bleeding if the penetrating implement exits the vascular lumen. It is always necessary to apply some degree of force to traverse an occluded vascular segment. The straightest approach possible greatly improves the transmission of force applied to the penetrating guidewire, needle or catheter by the operator. A guidewire or catheter is virtually incompressible along its length and therefore an absolutely straight course allows for the application of a great deal of penetrating pressure [Figure 2]a. If there is a bend or curve in the catheter or guidewire, however, only a portion (depending on the angle of the curve) of the force applied by the operator will be transmitted to the penetrating tip [Figure 2]b and c. The use of alternate sites for vascular access (such as the carotid or axillary artery for BT shunts) that allow for a straighter course may increase the chance of success. If the course is relatively straight, it may even be possible to use a transeptal needle as the penetrating tool if penetration with guidewires has not been successful. 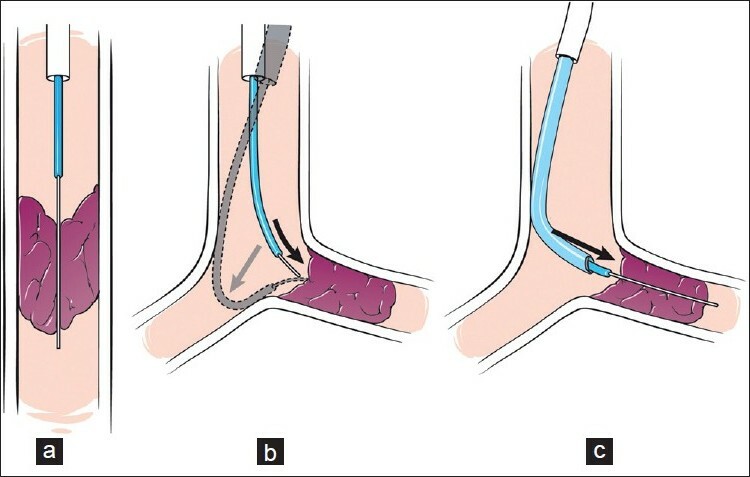 A transeptal needle from the jugular approach has been used by us and others to penetrate the superior Mustard baffle occlusions,  occluded pulmonary arteries after a Glenn procedure and in an acquired atretic aortic arch [Figure 3]a, b and c.
In some situations, especially in the pulmonary arteries, a straight course is not possible (at least if the pulmonary artery is still connected to the right ventricle and not to a Glenn or BT shunt). If a curved course is necessary, it may be possible to use a coaxial system with a long sheath and/or a guide catheter. The guiding system needs to be buttressed along its course against the heart or other structures [Figure 2]b and c. If the guiding system can be well supported, then it may be possible to advance an inner guidewire in the necessary direction with sufficient force. We have found that a combination of a Mullins sheath, modified guide catheter, hydrophilic catheter and hydrophilic guidewire ("guide and glide" system) can be especially useful in difficult situations  [Figure 4]a, b and c.
After the occluding lesion has apparently been traversed by a guidewire or transeptal needle, it is essential to verify that the tip is indeed intravascular. A small angiogram through the needle or the supporting catheter may opacify the distal vessel. A guidewire should move freely in the manner expected and not appear to be confined in tissues around the intended recanalized vessel. Once the intravascular position has been confirmed, a catheter can be advanced over the guidewire and past the occlusion. If the distal tip of the guidewire can be snared, then a relatively large catheter can almost always be advanced directly over the penetrating guidewire. If there is no ability to capture the distal end of the penetrating guidewire, then we prefer to advance a small catheter into the distal vessel in most cases. A hydrophilic catheter with a lumen that matches the penetrating guidewire is often most effective. The catheter is positioned in a safe location well past the obstruction. A relatively stiff guidewire can then be advanced into this safe position. Thrombolysis ,,, and mechanical removal of clots with thrombectomy catheter systems ,, have been used to recanalize vessels as well, i.e. systemic to pulmonary artery shunts. However, we feel that simple guidewire techniques using balloon dilation and/or stent placement can be performed with a good result in the majority of cases. This is particularly true if the occlusion has occurred recently (within 1-2 days). While this results in distal migration of small clots, it is surprisingly rare to see clinical sequelae as a result. In most cases, balloon dilation of the penetrating tract is performed initially with relatively small and low-profile balloons. After the tract is enlarged, a larger catheter and guidewire can be safely positioned. Simple angioplasty may be effective in some situations. In general, we try to avoid stents in small patients in areas where growth is expected. Stents may not be necessary for the treatment of acute occlusions presumed secondary to thrombosis if the probable cause for the thrombus can be eliminated. If the results of simple angioplasty appear questionable, however, we will proceed with stenting [Figure 1]c and d. Stenting almost always provides a larger lumen than angioplasty. However, the foreign material of a stent may increase the chance for subsequent acute thrombosis, and intimal ingrowth can lead to late lumen loss. We generally use aggressive anticoagulation early after placement of a stent in a completely occluded segment, especially if flow through the segment is relatively slow. We have found that it is usually safe to revert to simple antiplatelet agents in most patients if the stented segment remains patent for 2-3 months. There are very few reports of complications from attempted transcatheter recanalization procedures in the pediatric and congenital heart patients. Nonetheless, strategies for dealing with possible catastrophic vascular perforations should be considered before undertaking these types of interventions. We prefer to do these procedures with patients under general anesthesia. Blood and blood products should be immediately available. Surgical backup should be readily available in case of an emergency. In critically ill patients or early postoperative occlusions, it may be advisable to have the surgical team present or on standby. In many situations, little or no specific treatment will be needed if a perforation occurs immediately adjacent to an occlusion with only a small guidewire. If the vessel ruptures during subsequent dilation or stenting, then temporary occlusion of the site with the dilating balloon may be successful in stopping extravasation. Covered stents may be the best treatment option if available. Transcatheter recanalization of occluded vessels in pediatric patients and patients with congenital heart disease may be an underutilized treatment option in our field. In some cases, completely occluded vessels have not been treated because of marginal results and significant risks of surgical intervention coupled with lack of awareness of the newer transcatheter options. Reports of successful transcatheter treatments are increasing in this relatively unique population. We need to remain aware of advances by other specialty groups that treat vascular occlusions in different, usually much larger, patient populations. The disease processes and types of vessels needing treatment may not be identical, but some of the principles, techniques and devices may be applicable to our patients. Some of the devices currently being investigated and actively used in interventional radiology, vascular and adult cardiology laboratories include microdissecting catheters, high-frequency mechanically vibrated wires and lumen re-entry systems. While acquisition and mastery of some of these may be difficult for operators in our field due to low volumes, we suspect that some of these systems may eventually be more widely embraced if they can be demonstrated to add significantly to our current armamentarium. Recognition of the potential for transcatheter recanalization of occluded vessels, even with the current techniques outlined in this paper, will hopefully lead to more widespread consideration for this approach in our unique patient population. 1. Hannan RL, Zabinsky JA, Hernandez A, Zahn EM, Burke RP. Hybrid treatment of superior vena cava syndrome in a child. Ann Thorac Surg 2009;88:277-8. 2. Sreeram N, Emmel M, Trieschmann U, Kruessell M, Brockmeier K, Mime LB, et al. Reopening acutely occluded cavopulmonary connections in infants and children. Interact Cardiovasc Thorac Surg 2010;10:383-8. 3. El Tahlawi M, Bonello B, Fraisse A. Radiofrequency recanalization of an occluded long segment left pulmonary artery in bidirectional cavopulmonary anastomosis. Catheter Cardiovasc Interv 2010;75:773-7. 4. Bacha EA, Lang P, Mayer JE Jr, McElhinney DB. Connection of discontinuous pulmonary arteries in patients with a superior or total cavopulmonary circulation. Ann Thorac Surg 2008;86:1948-54. 5. Kort HW, Balzer DT. Radiofrequency perforation in the treatment of acquired left pulmonary artery atresia following repair of tetralogy of Fallot. Catheter Cardiovasc Interv 2003;60:79-81. 6. Fink C, Peuster M, Bertram H, Hausdorf G. Transcatheter recanalization of the left main pulmonary artery after four years of complete occlusion. Catheter Cardiovasc Interv 2001;53:81-4. 7. Moszura T, Zubrzycka M, Michalak KW, Rewers B, Dryzek P, Moll JJ, et al. Acute and late obstruction of a modified Blalock-Taussig shunt: A two-center experience in different catheter-based methods of treatment. Interact Cardiovasc Thorac Surg 2010;10:727-31. 8. Sreeram N, Emmel M, Ben-Mime L, Brockmeier K, Bennink G. Transcatheter recanalization of acutely occluded modified systemic to pulmonary artery shunts in infancy. Clin Res Cardiol 2008;97:181-6. 9. Gillespie MJ, Rome JJ. Transcatheter treatment for systemic-to-pulmonary artery shunt obstruction in infants and children. Catheter Cardiovasc Interv 2008;71:928-35. 10. Kogon B, Villari C, Shah N, Kirshbom P, Kanter K, Kim D, et al. Occlusion of the modified Blalock-Taussig shunt: Unique methods of treatment and review of catheter-based intervention. Congenit Heart Dis 2007;2:185-90. 11. Donnelly JP, Ryan TJ Jr. Revascularization of a thrombosed aortopulmonary shunt with the use of the AngioJet thrombectomy system. Catheter Cardiovasc Interv 2003;58:268-71. 12. Kokov LS, Korostelev AN, Grinko AN, Ilyina MV, Solopova GV, Aiazian E, et al. Recanalization and thrombectomy of internal anastomosis in a patient with tetralogy of Fallot using the AngioJet rheolytic catheter. Catheter Cardiovasc Interv 2001;53:504-7. 13. Ries M, Singer H, Hofbeck M. Thrombolysis of a modified Blalock-Taussig shunt with recombinant tissue plasminogen activator in a newborn infant with pulmonary atresia and ventricular septal defect. Br Heart J 1994;72:201-2. 14. 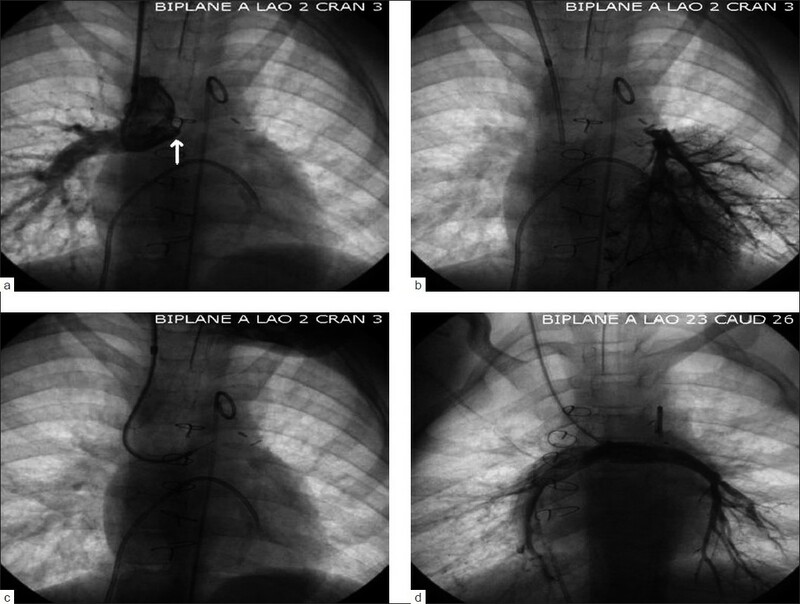 Sreeram N, Walsh K, Peart I. Recanalisation of an occluded modified Blalock-Taussig shunt by balloon dilatation. Br Heart J 1993;70:474-5. 15. Asgar AW, Miro J, Ibrahim R. Recanalization of systemic venous baffles by radiofrequency perforation and stent implantation. Catheter Cardiovasc Interv 2007;70:591-4. 16. Abdulhamed JM, al Yousef S, Khan MA, Mullins C. Balloon dilatation of complete obstruction of the superior vena cava after Mustard operation for transposition of great arteries. Br Heart J 1994;72:482-5. 17. Prieto LR, Kawai Y, Worley SE. Total pulmonary vein occlusion complicating pulmonary vein isolation: Diagnosis and treatment. Heart Rhythm 2010;7:1233-9. 18. Joseph G, Mandalay A, Rajendiran G. Percutaneous recanalization and balloon angioplasty of congenital isolated local atresia of the aortic isthmus in adults. Catheter Cardiovasc Interv 2001;53:535-41. 19. Koerselman J, de Vries H, Jaarsma W, Muyldermans L, Ernst JM, Plokker HW. Balloon angioplasty of coarctation of the aorta: A safe alternative for surgery in adults: Immediate and mid-term results. Catheter Cardiovasc Interv 2000;50:28-33. 20. Peuster M, Bertram H, Fink C, Paul T, Hausdorf G. Percutaneous transluminal angioplasty for the treatment of complete arterial occlusion after retrograde cardiac catheterization in infancy. Am J Cardiol 1999;84:1124-6, A11. 21. Frazer JR. Ing FF. Stenting of stenotic or occluded iliofemoral veins, superior and inferior vena cavae in children with congenital heart disease: Acute results and intermediate follow up. Catheter Cardiovasc Interv 2009;73:181-8. 22. Ing FF, Fagan TE, Grifka RG, Clapp S, Nihill MR, Cocalis M, et al. Reconstruction of stenotic or occluded iliofemoral veins and inferior vena cava using intravascular stents: Re-establishing access for future cardiac catheterization and cardiac surgery. J Am Coll Cardiol 2001;37:251-7. 23. Poncyliusz W, Falkowski A, Walecka A. Does use of hydrophilic guidewires significantly improve technical success rates of peripheral PTA? Med Sci Monit 2004;10:55-7. 24. Nykanen DG, Zahn EM. Transcatheter techniques in the management of perioperative vascular obstruction. Catheter Cardiovasc Interv 2005;66:573-9. 25. Zahn EM, Dobrolet NC, Nykanen DG, Ojito J, Hannan RL, Burke RP. Interventional catheterization performed in the early postoperative period after congenital heart surgery in children. J Am Coll Cardiol 2004;43:1264-9. 26. Dasi LP, Sundareswaran KS, Sherwin C, de Zelicourt D, Kanter K, Fogel MA, et al. Larger aortic reconstruction corresponds to diminished left pulmonary artery size in patients with single-ventricle physiology. J Thorac Cardiovasc Surg 2010;139:557-61. 27. Munce NR, Strauss BH, Qi X, Weisbrod MJ, Anderson KJ, Leung G, et al. Intravascular and Extravascular Microvessel Formation in Chronic Total Occlusions: A Micro-CT Imaging Study JACC Cardiovasc Imaging 2010;3:797-805. 28. Latson LA. Transcatheter closure of paraprosthetic valve leaks after surgical mitral and aortic valve replacements. Expert Rev Cardiovasc Ther 2009;7:507-14. 29. Rogers JH, Laird JR. Overview of new technologies for lower extremity evascularization. Circulation 2007;116:2072-85. Qureshi, A.M. and Hill, J.A. and Prieto, L.R. and Arruda, J. and Morrison, S. and Worley, S. and Latson, L.A.